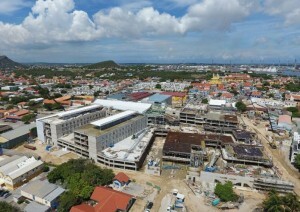 WILLEMSTAD – The original plan was to deliver the new hospital in Otrabanda on September 26 this year. It now appears that the provisional delivery date is August 13 of next year. That is almost a year later than planned. This was reported by the opposition party MFK during a press conference. The change of plans is mainly due to the untimely release of the construction site. In particular, the delay to demolish some of the old hospital buildings. Also, the location change had an impact on the completion date. The hospital was supposed to be constructed on the former Amstel property in Zeelandia. This property was already made available for the construction of the new hospital. A large number of changes to the construction contract were also mentioned as a reason for the postponement of the completion date. The evaluation committee indicates that the completion date could be delayed even further in the absence of a clear ownership, due to late decisions, slow performance, not documenting timely and changes in program requirements.